MICROWAVE AND DISHWASHER-SAFE: reheats food safely in the microwave and cleans up easily in the dishwasher (hand washing is recommended for the outer shell to preserve the leak-proof seal and extend the longevity of your product). Food-Safe and BPA Free: Made with thick sides, our kids bento boxes are as safe as they are durable!And because they’re reusable, they’re an eco-friendly, money-saving option. 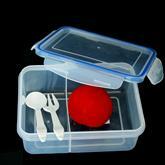 Endlessly Versatile: Microwave safe, our lunchbox bento containers heat evenly and withstand up to 120C! Great at home, school or work, they’re also freezer safe, so you can store leftovers. When you’re done, pop them in the dishwasher for a quick cleanup. To protect lid – clean them by hand to preserve the seal. 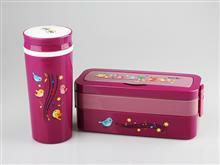 If order more than 3,000 pcs, customer can also choose their own fond color, or even making their own logo printing.